MIE Exerts - Have you completed the missions to attend the Global E2 in Paris? 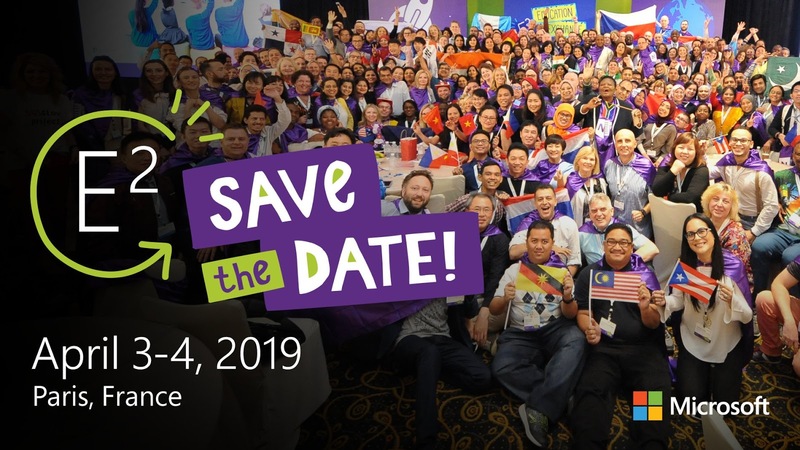 The Microsoft Global E2 event is taking place in Paris, France in April 2019. This week the South African/ Lesotho Microsoft Innovative Educator Experts will be selected to attend this prestigious Forum based on having completed certain missions over the past few months. We have been impressed to see how many MIE Experts have taken up the challenge of sharing learning activities on the Microsoft Educator Community; participating in the #Skypeathon and running #HourofCode sessions for their learners. It has been great to see teachers sharing what they are doing in their classrooms on Twitter and Facebook. In order for the team for Paris to be selected, MIE Experts from South Africa and Lesotho who have completed the missions are requested to apply here by midnight on Wednesday 12 December 2018. As part of this form you will be required to include a link to either a Sway or a video that includes your evidence of having completed the missions. The E2 Paris opportunity is only available to MIE Experts who have NOT attended a previous Global E2 Event. There is no field in the application form for the link to the Sway or video that contains your evidence of completing the missions - so please insert the link in the same field as your name. Ensure that the sharing permission for your Sway or video is set to allow "anyone with a link" to view it. If we can't view your evidence - we can't consider your entry for the E2 Paris opportunity. Well done to all of the MIE Experts who have taken on the challenge of completing the E2 Missions. We look forward to Microsoft announcing the South African/ Lesotho team to attend the Global E2 in Paris on Friday 14 December 2018. In October 2018, SchoolNet SA facilitators Hlengiwe Mfeka and Senzo Ngcobo completed the Intel Tablets in the Classroom for 28 GET subject advisors from Kwa-Zulu Natal at the Bergville Education Centre. These subject advisors had already attended two previous courses namely; ICT Skills for Teachers and Using Digital Resources in the Classroom. The Tablets course, which formed the final step in their professional development pathway, aimed to provide subject advisors with tools and strategies for integrating tablets into the classroom. In addition to the standard modules covered in this course, subject advisors completed a range of activities that introduced them to additional tools and collaborative strategies for teaching and learning in mobile environments. 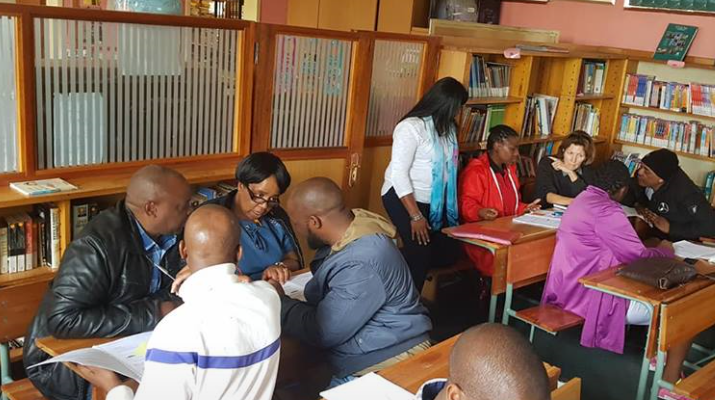 The subject advisors who attended the workshop were drawn from a range of districts across the province, including Umgungundlovu, Ilembe, Harry Gwala, Ugu, Amajuba, Umzinyathi and Uthukela. The group was described as “enthusiastic, jubilant and receptive throughout the week” and whilst most delegates had attended previous sessions, the four new delegates fitted into the group well. The workshop was opened by Mr R Masondo the MST & ICT Deputy Director. He warmly welcomed everyone and highlighted the technological knowledge gap which the department was trying to bridge through this professional development. After a second ice-breaker, a course overview was provided. Delegates learnt that across the week’s activities they would be covering the 6 C’s of the 21st century skills (critical thinking, creativity, communication, collaboration, citizenship and character) and that they would also be introduced to coding – whilst trying out different activities that would build these skills whilst using tablets. With the introductory plenary complete, participants were split into two computer labs to begin the hands-on sessions with the same facilitator they had worked with at previous workshops. On the first day subject advisors learnt about the jigsaw teaching strategy. Nomvuyo Thobela noted “This strategy ensures understanding of the content because each expert group member knows that he has to pay attention because he would have to teach his home group members later on”. On the second day the group completed the Hour of Code Minecraft Adventurer Tutorial. The facilitators noted that “at first, they thought it was just an easy game, that they’d cruise to the finish, but as they progressed, they realized that they had to apply their minds to move on to the next level of each puzzle. They agreed that coding does enhance creativity, collaboration and problem solving skills.” A further highlight of the day was using the tablets to create videos outside and then uploading these to YouTube. 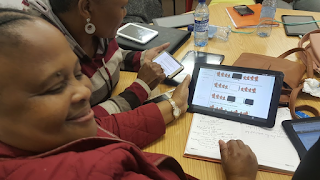 The third day of training involved a discussions about selecting quality educational apps and some hands on activities using a range of apps that are available on tablets. 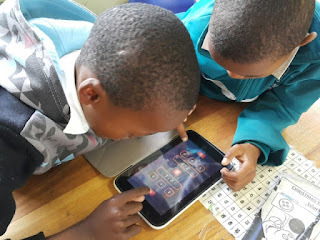 Mfeka reported that “delegates found these computational thinking activities very thought provoking and said this is what their learners needed to improve their performance, especially in the STEM subjects”. The fourth day of training involved groups learning about effective tablet management and internet safety by watching videos and sharing personal stories. Whilst other groups of subject advisors who have attended similar workshops have also enjoyed a Gala Dinner, this group showcased their talents in a range of performances that made the evening especially memorable. All delegates received certificates at the Gala Dinner, and delegates who had excelled in various activities across the week were recognised for their achievements. The course ended with subject advisors finalizing their action plans to ensure that their learnings would be shared across their districts, wrapping up their video uploads, thanking interns, and completing the course evaluation. Delegates expressed gratitude to the SchoolNet SA facilitators, with one subject advisor commenting that “This course has equipped me to contribute meaningfully to teaching and learning”. The Intel® 'She Will Connect' program was launched in September 2013 with the aim of reducing the internet gender gap and reaching 5 million women in Kenya, Nigeria and South Africa over five years. The milestone of reaching 5 million women across Africa was celebrated at a gala event at the iconic Liliesleaf Farm in Rivonia on 24 October 2018. SchoolNet SA was recognized as one of the lead partners of the initiative, with Suraj Shah, the Intel Africa Program Director, thanking SchoolNet SA for "your contribution, passion and efforts to empower women in Africa". The 'She Will Connect' program aimed to help women change their lives. It worked on the premise that when women are connected to the Internet, lives change – economic and educational opportunities are discovered, self-confidence rises, and connections are made. At the gala celebrations, a number of participants in the program shared their stories of how access to the internet, and some training in how to use digital tools, had changed their lives. Puleng Moyaha started as a 'She Will Connect' participant and now manages the Siyafunda Centre in Palmridge. 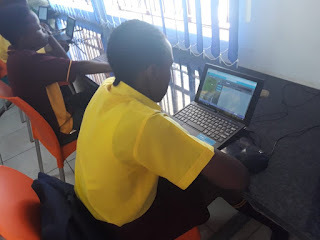 Puleng said she cannot live without the internet, and that being connected helped her to gain skills to use at her Palmridge Centre with her students. Nontokozo Xaba reported that she uses social media for advocacy. 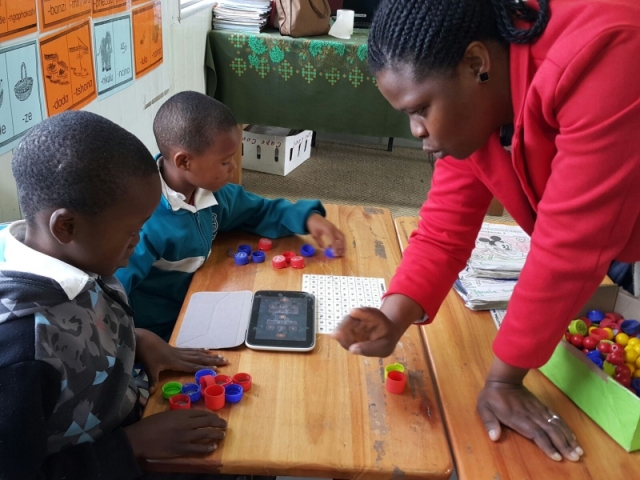 Sarah Mahlaba said that she now realizes that schools must teach learners about digital skills and digital technologies to ensure that learners are better prepared for the world. Anolia Lusunzi remarked that we must ensure our children know about opportunities to reach their dreams. The role of partners including SchoolNet SA, CareerBox, Siyafunda and the University of Limpopo was acknowledged by Shah - who noted that the accomplishment of reaching 5 million African Women could not have been achieved alone. SchoolNet's Omashani Naidoo and representatives from other partner organisations reflected on their experiences and highlights of being involved in the project as part of a panel discussion. Whilst the 'She Will Connect' project has reached a successful conclusion, all partners were encouraged to continue with their efforts to empower African women. The Trevor Noah Foundation is supporting New Nations School in Vrededorp, Gauteng, with the aim of providing vulnerable youth with the education, life skills, and social capital necessary to pursue further opportunities upon graduating high school. To support these efforts, Microsoft equipped the school with a lab of Windows 10 laptops and Office 365 email accounts, and commissioned SchoolNet SA to run some professional development workshops for staff to assist them to use the resources to enhance teaching and learning opportunities at the school. 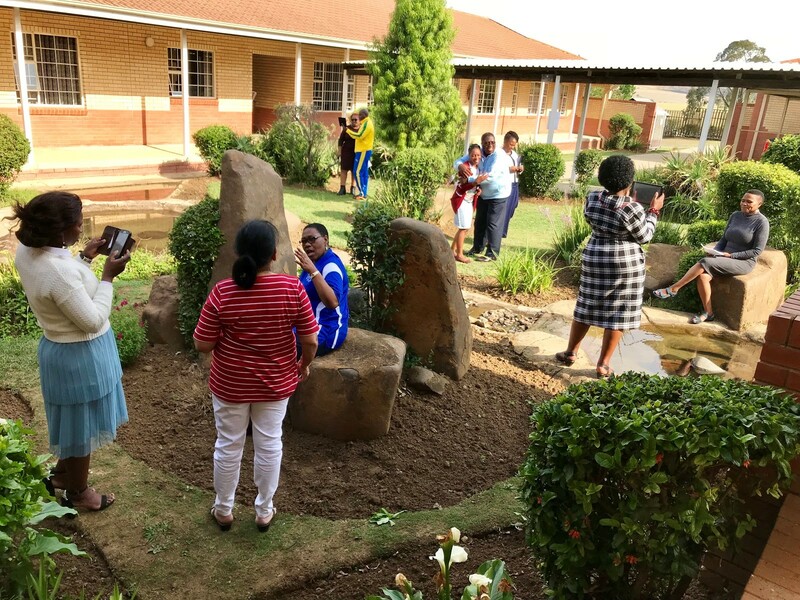 The first of these workshops, SchoolNet SA's “Change Leadership for Technology Integration” course, took place in August and October 2018 prior to the equipment being installed. The intention of this course was to help ensure that sound policies for using the donated equipment were in place and to maximise the potential for the technology deployment to be a catalyst for change in a school. 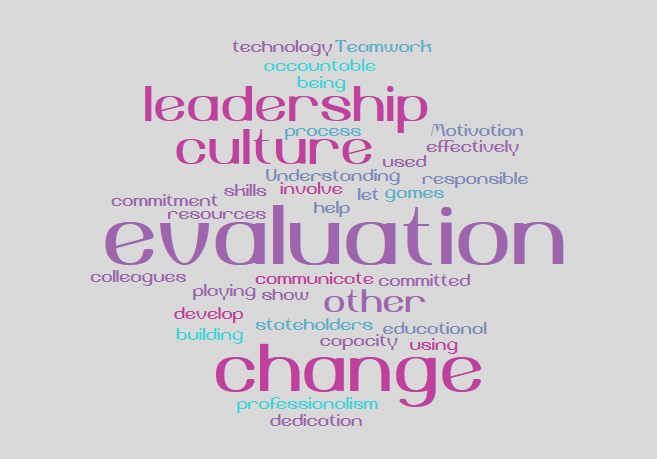 In addition to getting school leaders to think about and develop effective policies, one of the strengths of the Change Leadership course is that it uses a variety of methods to get school leaders to share their ideas as they work towards managing change effectively. The “Give One, Get One” activity involved teachers each conveying their idea to a colleague, getting an idea back in return. The “Gallery Walk” strategy, involved small groups of delegates each examining a document and writing their ideas around it, which were then further commented on by the next group to visit the exhibit. Examining case study scenarios of how other schools have managed their technology deployments also proved to be a non-threatening way of discussing the pros and cons of different approaches to technology deployments. We look forward to continuing to support the staff of New Nation School as they use technology as a catalyst for change. Are you a digital leader at a secondary school or tertiary institution who is passionate about supporting colleagues to make appropriate use of technology? 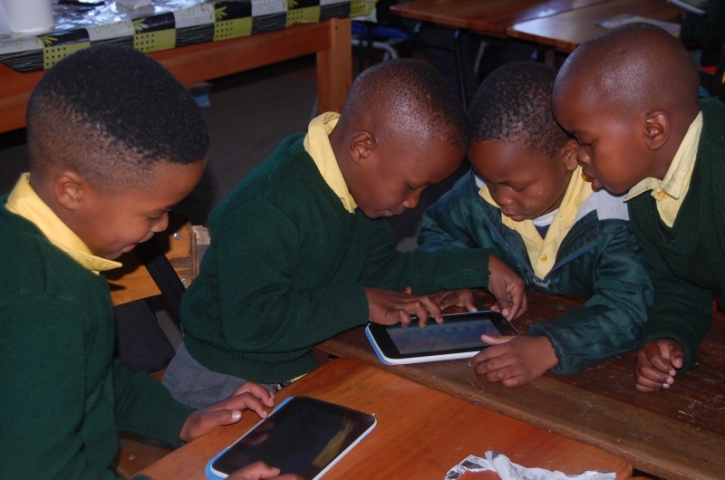 The Commonwealth of Learning has designed the C-DELTA (Digital Education Leadership Training in Action) programme in collaboration with the University of Cape Town to benefit all Commonwealth countries. The programme aims at fostering leaders in schools who can influence their colleagues to use digital learning appropriately and effectively for learning and for supporting sustainable development. SchoolNet SA is in the process of identifying suitable lead teachers to participate in the initial C-DELTA workshop and online training programme who will then be able to train colleagues and implement the programme at their schools between January and March 2019. The face-to-face workshop will be held in Johannesburg between 18 and 20 January 2019. Travel and accommodation for selected lead teachers will be covered by the Commonwealth of Learning. There is no cost to attend the workshop or to complete the online programme, however applicants will need to commit to training colleagues using the C-DELTA platform on completion of the programme. If you meet the criteria to be considered for this professional development opportunity, please send an email to janet@schoolnet.org.za with C-DELTA as the subject line by 31 October 2018. You will then be sent an application form to complete. Candidates selected to be part of the C-DELTA program will be informed in early November so that they can plan to be at the workshop in January 2019. To find out more about the C-DELTA programme, please visit their website or view the full concept note. During the October school break, 32 of the 42 Tshwane West interns attended a two day workshop. The intention of this session was to provide the interns with some strategies and resources that they can use when supporting teachers and learners with ICT integration and technical support. The sessions took place at the Thuto-Pele Education Centre in in Ga-Rankuwa. 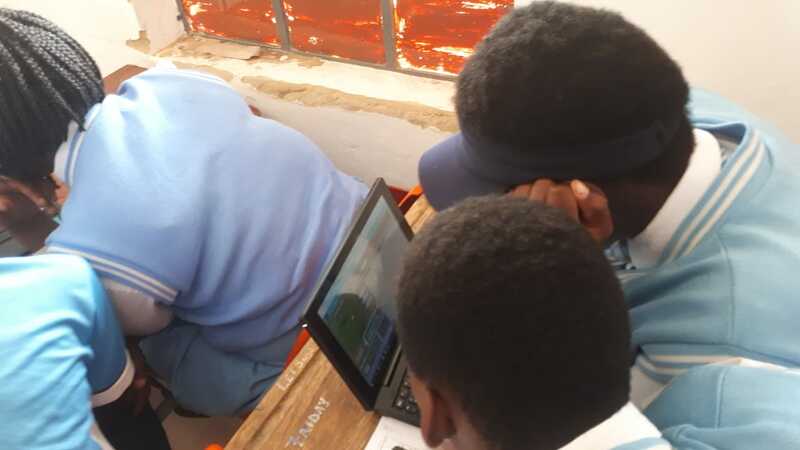 Whilst this centre had a computer lab, interns were encouraged to use their own laptops as these are the digital tools that they use at the schools they support. On the first day of training, 3 October 2018, SchoolNet SA facilitator Mathapelo Sehume and technical assistant Siya Ntshintshi encouraged participants to add their expectations for the workshop to a collaborative Google doc. The interns then "hit the ground running" with a challenge that involved each group being given a laptop with some technical issues that they had to solve. This exercise tested technical and problem solving skills and demonstrated the importance of following technical support processes and thinking systematically when confronted with technical challenges. Each group was then tasked with creating a PowerPoint presentation outlining the challenges the groups faced; the steps they took to resolve the challenges; and what it would take for the laptops they examined to be fully functional. These presentations were uploaded to a Google drive and one group member was randomly selected to present the findings of the group. This activity aimed to develop collaboration and presentation skills. The second day of training, 4 October 2018, began with a presentation from Pearson representatives. Their session aimed to provide the interns with the skills they would need to help teachers make better use of the Pearson resources that have been pre-installed on interactive boards provided in a Tshwane West schools. 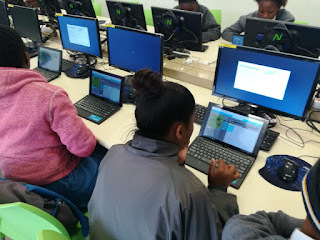 The delegates then moved to the computer lab where Megan Rademeyer from Schoolnet SA introduced the group to the “YourthSpark Hour of Code”. After explaining the Hour of Code concept Megan encouraged the interns to run Hour of Code sessions at their schools. The group worked through the first three Minecraft themed Hour of Code tutorials together, before the facilitator challenged the interns to complete the rest of the tutorials on their own. All participants were excited to try their hand at basic coding and wasted no time trying to complete the remaining stages. In the second phase of the training, Mathapelo introduced the interns to the Microsoft Digital Literacy course. She motivated the interns to encourage learners to complete the course to earn a digital competency certificate before learning school. Furthermore, Mathapelo encouraged the interns to assist the Grade 12 learners with their university applications. In the final session, interns were introduced to the Microsoft ICT Skills for Teachers course and began to work through some of the scenarios. Interns were encouraged to upload their completed artifacts to their portfolios of evidence and to share them with the facilitator for assessment. Interns were informed that helping teachers develop digital skills would make teachers more self-sufficient with performing administrative tasks, leaving interns more time to be of technical assistance. The training session ended with the team talking through the interns' expectations and how they were met through the training sessions. Most of the interns were delighted to be part of the training session and reported learning far more than what they were expecting. The group appreciated the initiative and were looking forward to implementing what they had learnt at the workshop when schools resumed after the break. SchoolNet SA teamed up with the Mpumalanga ICT Club to run a number of train-the-trainer workshops at different venues across the province. 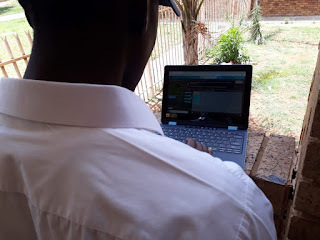 The aim of these sessions was to motivate teachers to learn some basic coding skills, and to then share these with learners by running the Hour of Code at their schools and getting their learners to code something "from scratch" using Scratch programming. In addition to trying out Scratch and the Minecraft themed Hour of Code tutorials, teachers were given tips on how to facilitate one of these sessions at their schools. Delegates were encouraged to join the Microsoft Educator Community to complete the "Facilitating the Hour of Code" online course, as well as other courses related to using technology in the classroom. Once they had experienced the basics of coding, delegates were introduced to Scratch, and attempted to code their own scene by dropping in pictures, music and movement blocks. With Africa Code Week coming up between 5 and 19 October 2018, and the International Computer Science week taking place in the first week of December 2018, the idea behind these sessions was to upskill as many Mpumalanga teachers as possible to be able to run introductory computer science sessions for their learners. An important part of each session was Nomusa Keninda's presentation about the Mpumalanga ICT Club and the role that this community of practice plays in empowering teachers, learners, community members and youth to develop IT skills. It is hoped that teachers in other districts will be encouraged to start their own communities of practice and that they will establish coding clubs in their schools and communities. At this session, the teachers who arrived early were encouraged to do the Google Code Bunny activity whilst they waited for the session to start. This activity was developed as a Google Doodle to celebrate 50 years of kids coding, and it provides a fun way of introducing coding to children who have never coded before, and who can't yet read complicated instructions. Whilst the activity starts off simply, it soon requires some computational thinking to get the bunny to the carrots! The attendance at this session was better than expected - with over 70 teachers heeding the call to learn some basic coding. 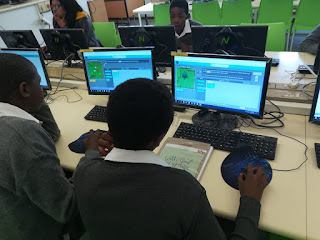 Unfortunately the internet was down in one of the labs but by using the offline Hour of Code Minecraft Adventurer materials we were able to demonstrate how the lack of connectivity needn't be a barrier to learning some basic coding. After the plenary sessions, the group was split into two with each group taking a turn to do some Scratch programming and to try out the Hour of Code. We were impressed with a number of teachers who easily reached the final level in the Hour of Code Tutorial, earned their certificate and then went on to assist other teachers in the room who needed a bit of support. We know there are definitely some potential facilitators in this group! This session, held at the Ehlanzeni offices of the Mpumalanga Department of Education was also the kick-off event for this district's own community of practice championed by Zanele Khumalo. The teachers of Kanyamazane were excited to wear white clothes and flower ribbons - which have become the brand of the Mpumalanga ICT Club. Although we had some challenges getting the materials loaded on to teachers and officials' own laptops, this proved to participants that they can use the equipment they have available to run sessions for their schools. Furthermore, we are hopeful that those who didn't reach the end of the tutorial at the workshop will complete it in their own time. If you have the opportunity to attend a face to face workshop, please do join us. However, we'd also encourage teachers to check out Nomusa Keninda and Megan Rademeyer discussing how to facilitate the hour of code on the Microsoft Virtual Academy. Finally - the whole idea of attending a training of trainers workshop is to train others - so we do encourage teachers who attended the workshops to train their colleagues and to run basic computer science workshops for their learners. If the teachers got this excited when they coded Steve or Alex to complete a challenge, image how excited learners will be to write their first line of code. The International Olympiad for Informatics (IOI) is an international coding competition for high school learners that takes place in a different country every year. This year, a record 335 participants from 87 countries travelled to Japan to put their programming skills to the test. The South African team consisted of Tian Cilliers (Stellenbosch High School), Ralph McDougall (Curro Durbanville) Taariq Mowzer (Fairbairn College) and Emile Tredoux (Parklands College). They earned their spots at the 30th IOI in Tsubuka, Japan by winning the 2017 Standard Bank Computer Olympiad. Whilst contestants were given a choice of programming languages to solve the six problems they were presented with, most used C++, seven used Java and only one used Pascal. Disappointingly among the 355 participants there were only two or three girls. In an effort to encourage more females to participate, the Institute for IT Professionals is issuing bursaries at school level and beyond to female coders. The winners of the 2018 Standard Bank Computer Olympiad will compete in the International Olympiad for Informatics in Azerbaijan, and the 2019 winners will travel to Singapore in 2020. If you are a high school learner with a passion for coding and you would like to earn a spot at one of these international events, read more about the South African Programming Olympiad and look out for next year’s competition in March 2019. If you are just starting out, and want to develop the thinking skills that will serve you well in programming, we encourage you to try out the Talent Search computational thinking challenge.